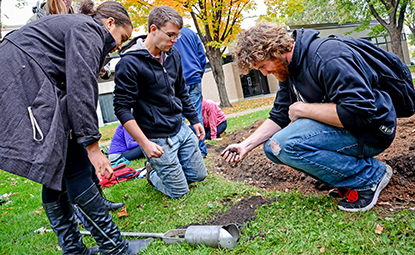 Students who choose to major in the earth sciences bring together a range of science fields including meteorology, astronomy, hydrology, environment and geology. You'll start with a base of math and physics taught by professors who excel at research into the latest issues of earth science and practice in an array of up-to-date laboratory and research facilities. You'll be able to tailor your selected emphasis through a range of electives and develop the skills to practice what you learn in those laboratories, and through student research, internships and fieldwork experiences. Program structured to accommodate students interested earning an additional major or multiple minors. Active student organizations that engage earth science students socially and in community, state and world issues related to weather, wind energy and water. Faculty engaged in research that addresses current issues and topics relevant to changes in the Earth. Hazardous Waste Operations and Emergency Response Standard (HAZWOPER) training for students interested in the environment. Host of 2013 Mobile Laboratory Coalition Conference for STEM educators, professionals and partners.